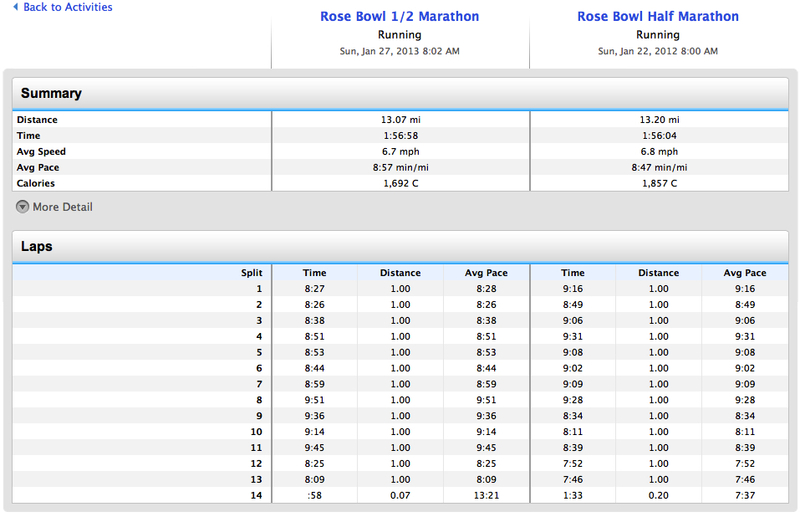 Rose Bowl 1/2 Marathon. Do I get out of the car? This is the second year that I have done this race and when I got out of bed I knew it was going to be a challenge. After a bike crash on December 8th that left me with a broken clavicle, I had not run in 6 weeks. This race was on January 27th and only provided me with 1 week of training. Basically, three quality runs the week before the race - two long runs and 1 tempo run. To compound things, the forecast called for rain! When I got out of bed at 6:00 AM, it was wet and drizzling, but I though the worst had past and got ready to run. Breakfast was standard - 1 scoop of egg protein with water and a piece of toast with sugar free jelly and better-than-butter spread. I dressed for the event in running shorts, craft sub-zero base layer, PTC technical t-shirt and a light weight running jacket. I supplemented this with gloves and a beanie to be on the safe side. I also wore arm warmers. The day was not cold. Temps were in the 50's, but I was worried about the wetness. I got to the race and it was raining. 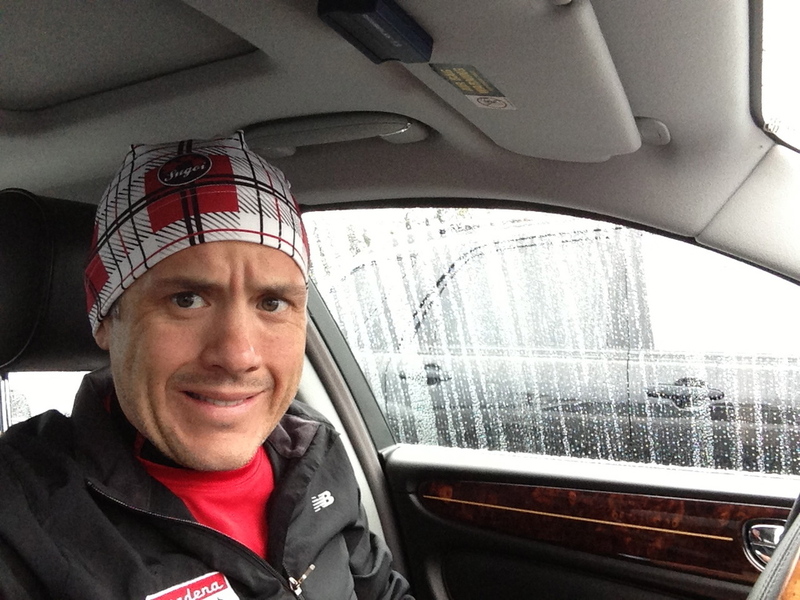 I went to packet pick up, got my stuff and was back in the warm, dry comfort of the car at 7:00 AM. That left me with about an hour to consider my options. What to do about this rain?? Note the water on my windows as I consider just going home. At about 7:30 the rain abated and it seemed like a run was in order. I toed the line at 8:00 AM with about 400 other brave souls . The course basically goes down hill for the first 2.5 miles before turning around and steadily climbing for the next 7 miles or so and then back down to the finish. Here is the map. The run starts headed South and then goes all the way to the North before returning to the middle. The race was pretty dry through the first 7 miles. I actually over heated a bit and needed to shed my gloves, beanie and running jacket. But, it was too good to hold. At mile 7, as we neared the foothills, the skys just opened up. It went from sort of wet mist to full rain pretty fast. This top part of the course takes place on the Hahamonga Water Shed, which is designed to flood and hold water during rain. As a result, there was standing water, little rivers rushing across the path and brutal muddy sections. The kind of mud that just grabs your shoes and slides. It was even hard to see in the rain. At one point I was running through flooded areas with an inch or more of standing water. Then the wind started. At this point I was just cold and trying focus on my foot place placement. My big fear was that I might stumble, fall and re-injure my clavicle. 65% of this race was run on soggy, muddy trails. The last two miles were around the Northwest side of the Rose Bowl and this is where I tried to push it, but I was just cold, wet and out of gas. I made the turn into the bowl and finished on the 50 yard line after a little 100 meter sprint. Here I am showing off my finishers medal looking like a wet rat. Note the big water drop hanging from my ear. So, how did I do? Well, versus last year, my results were almost identical to my 2012 race total time wise. Versus the field, I did much better. I was 10th in Age Group and 90th overall. Which I suppose is massive victory. 2012 was a clear sunny day and I had two months of solid training going into the race. At the end of 2012, I had some great fitness gains and was certainly is MUCH better shape prior to my fall in December. If you look at the comparison, the issue seems to be weather and endurance loss after 6 weeks injured. The last three miles versus last year is where I faded. Now I know where I stand and what I need to improve on as battle back to where I was. I think the 6 weeks probably cost me 30 seconds per mile. It should be interesting to see what next year brings. January 29, 2013 by Dino Sarti.